I’m such a Disney fanatic that it doesn’t matter what time of year I visit the magical House of Mouse; all that matters is that I’m there and biting down into a turkey leg within my first twenty minutes after arrival. The first time I’d visited Walt Disney World at Christmas was back in 1996 when Disney decided to decorate the timeless Cinderella’s Castle like a giant birthday cake. Apparently, it was an ironically “tasteless” decision for guests, but as a doe-eyed six year old who firmly believed that Mickey Mouse was real until I was 12, I thought it was fantastic. Again, it’s Walt Disney World. Isn’t that enough said? (This was us on Christmas Day stuck for about 45 minutes in Fantasyland just trying to walk). My dad, fiance and I wanted to go to our favorite spot for our first Christmas without my mom. Disney had always been our favorite place growing up, and a part of that has always been because the magic overtakes you the second you arrive. Especially this Christmas, we wanted the opportunity to escape the reality of not seeing my mom’s presents under the tree, of not hearing her make breakfast and subsequently cursing because she never knew how to make an over-easy egg, to not spending the most family inducing holiday with…our actual family. Walt Disney World was not only a place where we could escape the reality of my mom’s death, but be somewhere to celebrate the memories she helped us create for the twenty-six years I had her. We stayed at one of the economy hotels, Disney’s All Star Sports Resort, which was actually our favorite out of all the “All Star” resorts we previously occupied. There’s something so exciting about being around larger than life surfboards and shark fins, and an enormous football field where “real” snow fell from the sky every night at 6 o’clock. On our last morning in the resort, a Cast Member advised us that the park usually hits capacity on Christmas Day. We thanked her for the head’s up, and then brushed her off when we got on our bus, eager to begin our magical day at the Magic Kingdom. Well what she told us was no joke – there were people everywhere. Even smaller rides, like the Tomorrowland Transit Authority PeopleMover and even Walt Disney’s Carousel of Progress were inundated with visitors! There were cast members segregating the flow of traffic, holding up arrows and signs and helping navigate the overwhelming flow unlike any I’d ever seen before. I’d visited Disney during the holidays before, but I had never seen it as busy as it was this past holiday season. The park hit capacity around noon and we darted out of the park after making our way through Fantasyland, ducking the hoards of people in Frontierland and grabbing the first bus that came around. It sounds like a headache but it was the furthest thing: it gave us the opportunity to head back to the hotel, unwind in the warm water, grab a bite to eat and actually enjoy Christmas talking with one another. We opened up presents, laughed, reminisced about all the holidays my mom made so magical and wonderful, we took pictures with Santa in our lobby and frolicked in the foam snow that fell from the sky at our resort. It was an absolute blast and by far one of my absolute favorite days spent in Disney World. We were so busy, then heading off to Hollywood Studios, that I actually forgot it was Christmas! Each park and resort is decorated so beautifully for the holidays: larger than life trees, decorated with every ornament you could imagine, children wearing Christmas shirts and Christmas hats, sipping hot chocolate and singing Christmas carols. There’s just a spirit of Christmas that flows throughout the kingdom. It’s unlike any other way you’ll celebrate the holidays, even if you’re not spending time in the parks on Christmas Day itself. John and I visit Walt Disney World often and this past trip was our first time utilizing the Memory Maker. It allows you to capture every picture they take in the park – from rides, to pictures in front of iconic park staples, and everything in between. It was worth every penny! One thing I love about the photographers in Disney is that they sometimes add a little magic to your photos without you even realizing it. My mom’s favorite Disney character was Tinkerbell. The day before she died, I told her that I was wearing brand new Tinkerbell scrubs to work. She got so giddy and excited and asked me to send her a picture of them that night so she could see. It slipped my mind when I got home, only to remember later that night after the scrubs were lying on my bedroom floor and I convinced myself I’d just send her the picture the following day. I received a phone call at 6:30am the next morning that my mother had died. It’s that typical, irrational guilt that I still carry with me more than a year later that I never sent her that picture. So ever since, I try and find symbolism that my mom’s still near me whenever I run into something Tinkerbell. When the photographer uploaded these pictures to my Magicband, I was stunned of who he added. Walt Disney World may have hit capacity on Christmas Day, but that couldn’t matter to me in the slightest. It’s still a place that is in a world of its’ own, a world of wonder and of magic and of happiness. 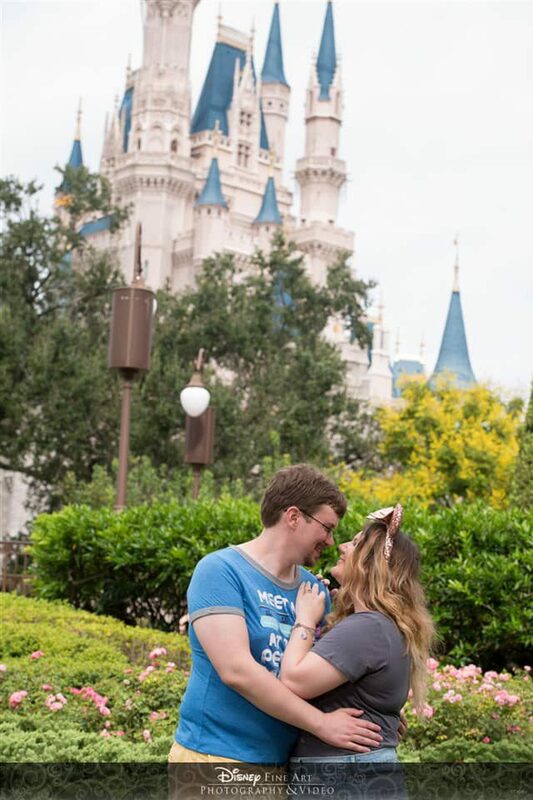 There’s no way that photographer could have known what Tinkerbell meant to me, but I’m glad my mom convinced him of it anyway.